Sagebrush steppe grasslands once blanketed the hills and flatlands of the Great Basin of the Western US. These 40 million hectares of sagebrush support regional biodiversity and provide the foundation for a food web critically important to humans, serving as the base for our rangeland livestock industry and a water source for some of our fastest growing population centers. Due to mismanagement—such as fire suppression and improper livestock grazing—one-third of this ecosystem has been lost. Invasive cheatgrass and the expansion of pine species has led to a six-fold increase in fuel loads in some areas, and climate change will likely further exacerbate fire risk. The decline in fire frequency and the increase in fire risk have altered sagebrush ecosystems further, while running up a tax bill of millions to control fire hazards. Federal land managers have used ad hoc approaches such as prescribed fire, mowing, and herbicides to restore Sagebrush ecosystems, but these have primarily been site-specific actions with largely unknown costs and efficacy. 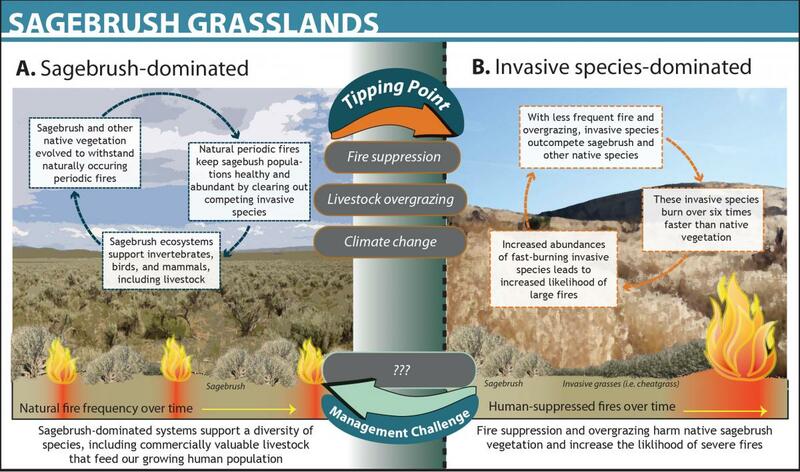 The Sagebrush Steppe Treatment Evaluation Project (SageSTEP) is a long-term study to evaluate the effects of fire on sagebrush ecosystems and the costs and benefits of various management alternatives to restore sagebrush (Artemisia spp.) communities. SageSTEP set out in 2006 to uncover scientifically sound and cost-effective methods for managing Sagebrush by testing hypotheses around the amount of native sagebrush or woodlands critical for maintaining ecosystem health. Researchers discovered two thresholds increasing the vulnerability of the ecosystem to invasive species and fire. Overgrazing of the grassy understory, which provides space for further intrusion of woody pines, dramatically increases fuel loading and the likelihood of fire. In turn, a second threshold is reached when erosion and soil nutrient loss due to excessive fire leads to a loss of native grasses—reinforcing the proliferation of invasive grasses and woody pines. Fire and grazing together have led to dramatic reductions in sagebrush grasslands. From the beginning, SageSTEP prioritized long-term monitoring of ecosystems, understanding that systems are unlikely to stabilize until many years after human intervention. Spawning from SageSTEP, an abundance of research and guidance documents now inform sagebrush management. However, monitoring all vulnerable lands is unrealistic and the challenge of funding precautionary management has led to continued degradation of these native grasslands. Further, limited oversight (most sagebrush ecosystems are owned by private ranchers) and overlapping jurisdictions of federal authorities (e.g., Bureau of Land Management, the Forest Service, the Department of Fish and Wildlife) have led to inadequate management action. Despite cost-benefit analyses demonstrating that fire suppression is unviable, there has been limited diffusion of more efficacious land-management alternatives recommended by SageSTEP. 1 Sheley R, Sheley J, and Smith B. 2014. Cost/benefit analysis of managing invasive annual grasses in partially invaded Sagebrush Steppe ecosystems. Weed Science 62:38-44. 2 McIver, J.D. ; Brunson, M.; Bunting, S.C., and others. 2010. The Sagebrush Steppe Treatment Evaluation Project (SageSTEP): a test of state-and- transition theory. Gen. Tech. Rep. RMRS-GTR-237. Fort Collins, CO: U.S. Department of Agriculture, Forest Service, Rocky Mountain Research Station. 16 p.